Parish Offices will be closed April 18-22 in observance of Easter and to allow staff to spend time with their families over Easter. Fr. Matthew will be out of the office from April 22 through April 26. There will be no Holy Hour, Confessions, or Daily Masses April 22 through April 26. 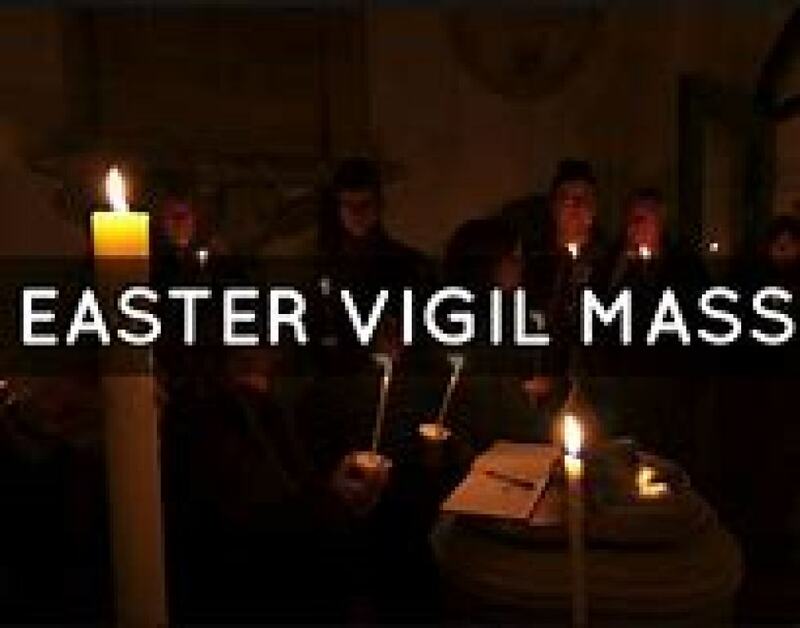 An Easter Vigil Reception will be held following the Easter Vigil to celebrate the Resurrection of our Lord and also to honor the confirmation of our newest members from the RCIA Class of 2019. Please bring your favorite finger food to share. You can sign up to help with the reception on a volunteer sheet in the Gathering Space after Mass or you can call the Parish Office. Seminarian Education Easter Sunday Collection -- We ask for your generous response to the second collection which will be taken in all churches of our Diocese on Easter weekend. This collection will help meet the growing needs of our Seminarian program. We currently have 36 young men studying for the priesthood at St. Joseph Seminary in Charlotte, at the Pontifical College Josephinum Seminary in Ohio, and at the Pontifical North American College in Rome. We look forward to the time when they will be able to begin their service as priests in the Diocese of Charlotte. 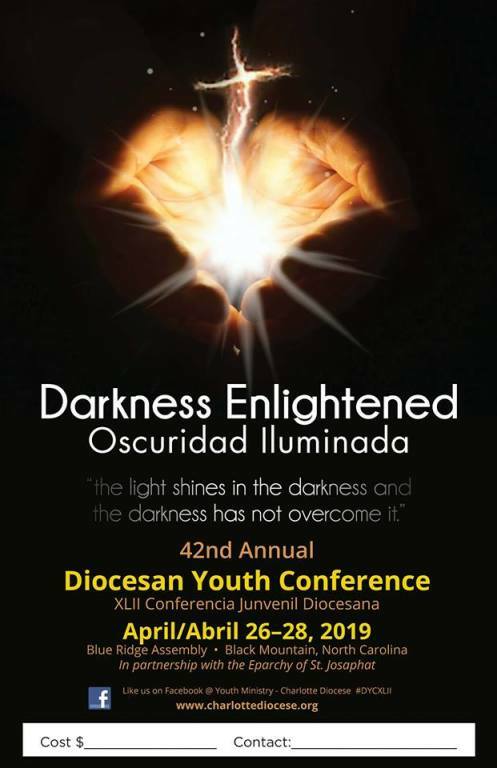 "Darkness Enlightened" is the theme for the 42nd annual Diocesan Youth Conference which will take place at Blue Ridge Assembly in Black Mountain, NC from April 26 - 28. Registration opened on March 1. Go to https://charlottediocese.org/ev/youth/events/diocesan youth conference/ for registration and information. The Angelic Warfare Confraternity is a supernatural fellowship of men and women bound to one another through prayer and dedicated to pursuing and promoting the virtue of chastity together under the powerful patronage of St. Thomas Aquinas and the Blessed Virgin Mary. The Confraternity is an official apostolate of the Dominican Order. Fr. Matthew will be conducting an enrollment following the 11 AM Mass on April 28th. For more information, go the www.angelicwarfareconfraternity.org. The traveling Mary's Sons Kneelers will make a stop at St. Elizabeth on May 7. Click HERE to learn more. Deacons Britt Taylor and Alfonso Gomez will be ordained into the Priesthood on June 22, 2019, at 10:00 AM at St. Mark Catholic Church, 14740 Stumptown Road in Huntersville, NC. Both have been summer seminarians at St. Elizabeth’s. If you can, please join us as we celebrate their ordinations, and please continue to keep them in your prayers. Mark your calendars for Totus Tuus, Summer 2019! 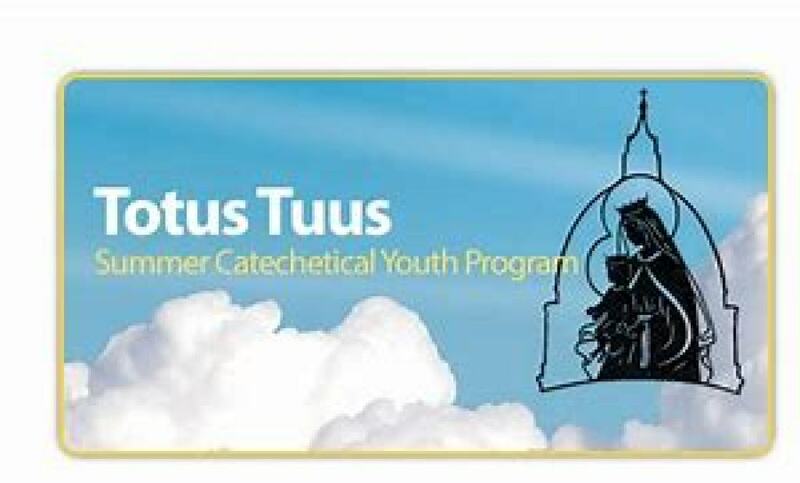 Totus Tuus for this summer (Summer catechetical program similar to Vacation Bible School) will have a sign up forms and information available in the Gathering Space and Parish Office soon. Totus Tuus will be the week of June 23-28th. Rising 1st - 6th graders will meet June 24th through 28th from 9:00 AM until 2:30 PM. Rising 7th graders through 12th graders will meet June 23rd through 27th from 7:00 PM until 9:00 PM. Children from other parishes are welcome, including Catholic friends or cousins that want to join your children for the week. Grandkids are welcome, too! Cost is yet to be determined but is expected to be minimal with discounts for multiple children. You can view a promotional video of the program HERE. For more information or to register early, contact Batrice Adcock at batriceadcock@gmail.com or call the Parish Office. 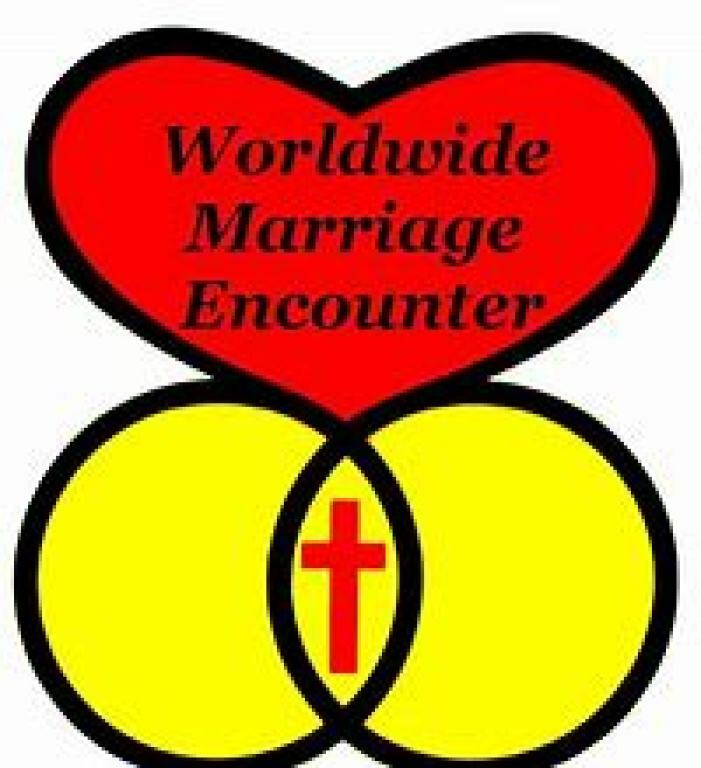 Sign up today to attend one of the upcoming Worldwide Marriage Encounter Weekends. They will be held on June 21 - 23, 2019 in Cary, NC, July 19 - 21, 2019 in Charleston, SC, and September 20-22, 2019 in Charlotte, NC. For more information and registration, go to https//NCMarriageDiscovery.org, email applications@NCMarriageDiscovery.org, or call 704-315-2144.